Lolol Savage back at it I'm not surprised. 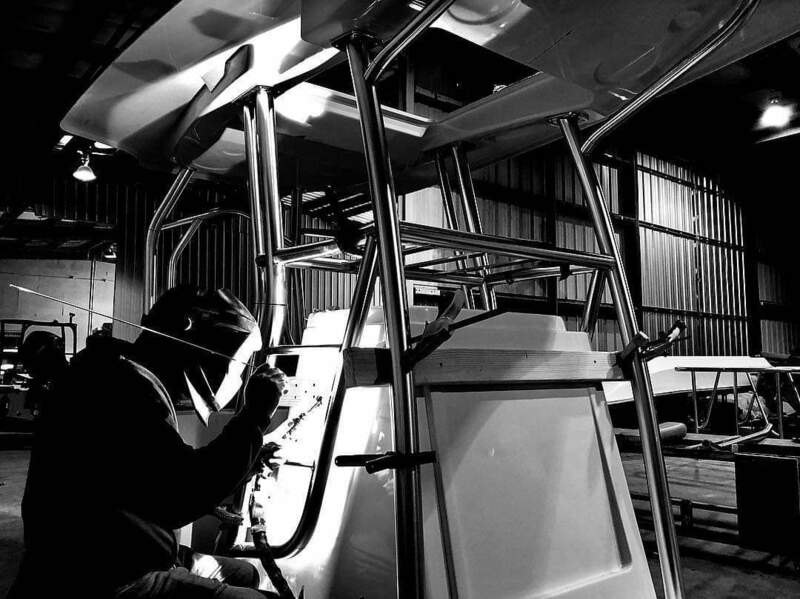 Ben Sheaffer builds one of the finest boats on the water, Truly a lifetime build. Very few can make that claim and Cayo isn't one of them yet. johnboy114, Flatout71, haneyrm and 2 others like this. man you got me on all accounts....cant believe you found me out. You wouldn't happen to be manoverboard123 brother would you? To help bring the thread back on track, I spoke to JB over the weekend for a progress update and to hunt down some more pics. The console, leaning post and hardtop mock-up got finished and are ready for pipework. Still a few weeks out for the tower and final rigging to be complete. Drone shots of the deck layout are upcoming, he sent me a decent angle from his office but can’t attach it until I post more. I asked about realistic timing expectations and was told September, we’re #7 on the list for perspective. If all goes well with the sea trial and walk through, she’ll be a SWFL boat fishing the outer flats, wrecks and hittin Keewaydin with the fam. Tokio,TX, N2theblue and KrazyKona like this. Last I checked on the Instagram, top was being installed with a 2nd station. After further review of the post on insta, it seems the installation is being conducted on hull #2? Console has no electronics and I don't see a lounger in front of the console. Planning on stopping by again this afternoon, ill try to take some pics. Get a pic with 4 guys in the boat so we can see hoy roomy she is. or it's the welding jig? Your right. I see it now in the 2nd picture. Thank you for clearing that up. So hull number 7 will be ready by September? Will the first boat have a TM on it? That’s JB’s estimate. Says it’s going to take a few months to get the assembly line rolling but is still targeting 15 this year and 2-3 month starting next year. Where are you based put of? Would love to check it out when you get it. 2-3 per month starting next year, that will be a sight to behold. Are these considered custom boats? I hope he does it, but I am very sceptical about that amount of production. Does anyone know how many the guys at Calcutta are turning out? I am guessing Calcutta, who has been building boats forever, is at maybe one every 5 weeks, if that. How much space do they have over at Cayo? If they are turning out 2-3 per month they are going to need to be able to have an assembly line of what? Like 16 boats in various stages of production? That is a lot of space. It will be interesting to see how this all ramps up. That's an aggressive production target. If they put out that many a month, better keep an eye out for quality control. Love the boat but the worse thing they can do is slip on quality.